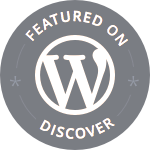 Blogger friends – Suzanne of The Travebunny, Kathryn of Travel With Kat and Wilbur of Wilbur’s Travels – have nominated me for yet another challenge. The Thomas Cook Explore The Elements Travel Photoblogging Challenge requires me to publish photos that best represent my interpretation of the four classic elements of Earth, Water, Fire and Air. 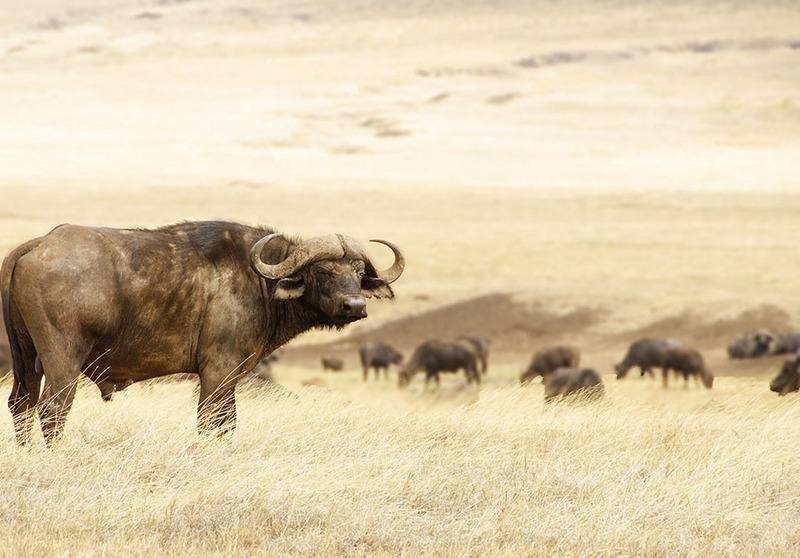 The buffalo is said to symbolise strength and abundance. This magnificent specimen and the vastness of the Ngorongoro crater beyond, seemed to me to embody every feature associated with the element Earth. The life giving and cleansing properties of water make it an esential element in many religions. Buddhist and Shinto shrines have Temizuyas at their entrances. Most mosques and churches their ablution/ baptism fountains. 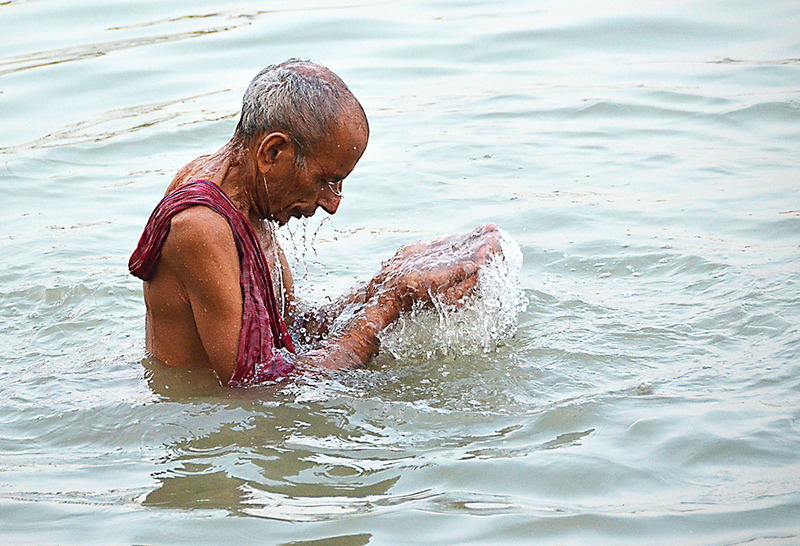 Hindus use temple ponds or their holy rivers. This candid shot captures a priest performing his ritual ablutions in the river Hooghly – a tributary of the Ganges in Kolkata. As the flame of knowledge that dispels the darkness of ignorance, fire is central to Hindu rituals. Its power of devouring destruction associated with the cleansing of egos. 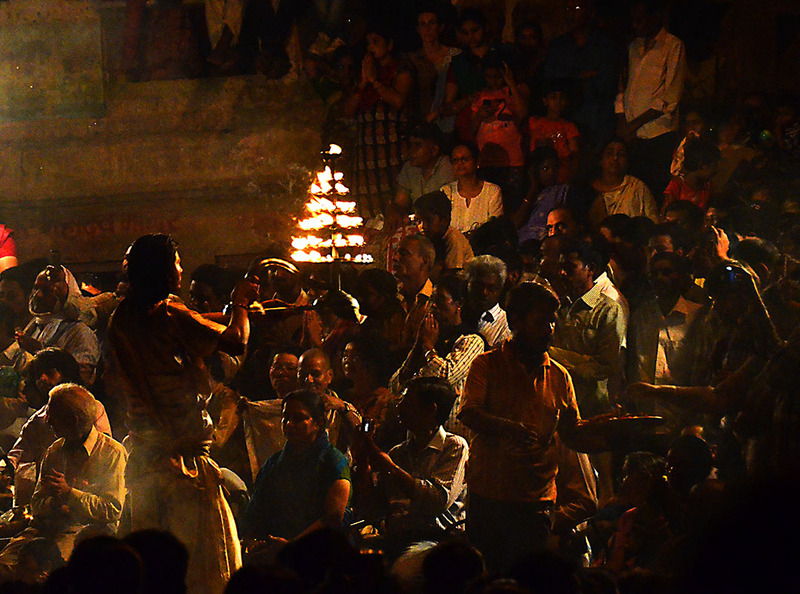 Regardless of ones beliefs, it is hard not to be swept up in the energy and fervour of the Ganga Aarti in Varanasi. Air was the hardest to go symbolic with. So I stuck with a more straightforward interpretation of a balloon. 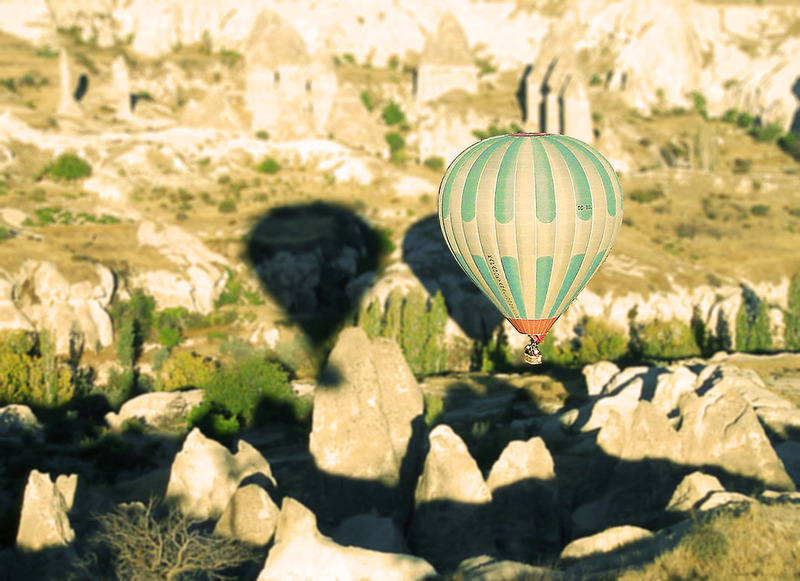 Floating over the surreal landscape of Cappadocia remains one of our most memorable experiences. Thank you Suzanne and Kathryn for the nomination. With the 16/03 deadline just a day away, I throw this challenge open to those of my readers that want to attempt it. There are great prizes to be won: Four individual category winners will receive a MacBook Air, a Fujifilm X-T1 camera, or an iPhone 6 with Bose noise cancelling headphones, depending on their personal choice. The overall winner will be awarded an amazing £5,000 travel fund. Go on, try your luck…. Great shots Madhu, especially the first two – very apt. Good luck! Thank you Kathryn. To you too! I don’t think I’m going to make it, as today is the last day, and I”m rather busy at the moment. Of course 🙂 Thanks Dallas. Thank you Sonel. They don’t hold a candle to your latest shots though. What a fabulous set! I enjoy your written breakdown of the elements. Thank you for stopping by to let me know. awesome pics madhu…i loved earth the most…all the luck to u!! Thank you very much Anushri. Oh, Madhu, these are wonderful photos! Best of luck!! Fire is the most appealing photo for me because it reminds me of a very moving ceremony I went to in Rajasthan. Wonderful Madhu and good luck! Mine too and for the same reasons Gilly. Madhu, I agree some great pics and also agree with the consensus that the first two are awesome. It would be a great shame if these did not qualify for the competition as you do have to nominate five bloggers to qualify I think. I actually nominated you myself this morning having only just entered myself. Your pics blow mine away I think, but I just went with some of my memorable ones when digital cameras were just a twinkle in the inventors eye! Shall be over to check out your entry. Apologies for not participating in the B&W challenge. Thanks Madhu, I will remember that. I know what you mean with pro competition but reckon your buffalo pic will stand out as something different to what most ‘earth’ pics will show. That is an amazing photo. Congrats. All the best! Beautiful photos Madhu. I especially love earth and water. Gorgeous. All exquisite shots Madhu, exotic elements indeed! These are amazing photos, Madhu. I especially like the water one. I really hope you win. Terrific interpretations, Madhu. Good Luck! That water one brought back so many memories of pilgrims bathing in holy water. Yes, that’s a common sight, in the North especially. This is from our photo tour in Kolkata. Madhu, perfect shots and representations. You absolutely hit these, all four of them. That’s a great selection of photographs. Each of these images is awesome! You are it, Madhu. No bias. I don’t even have to say Good luck. I don’t think you need it. All images speak for itself. Love the first two… good wishes Madhu! Thank you Ishita. I might be passing your way early September. Shall let you know if I manage a stopover. I’ve just scrambled a last minute entry 🙂 🙂 I was only tagged 2 days ago and wasn’t sure I’d have time. Love your ‘fire’ shot! It’s so alive! Good luck! That’s travelling money you could save 🙂 🙂 Not to mention blood pressure levels! Woooo! Way to go, Madhu…..nice images, and the reasons representing the four Elements, as depicted in your photos. Fitting images Madhu. All the best! Thanks Uday. Still too busy? Wonderful shots and even better words. Of the four, the water section touched me the most. I love your four elements post Madhu. well I hope they post the winners of this – and in your post – I like the balloon image (Air) the most – but all flowed so well – and what nice idea for a challenge – I bet it will be hard to pick winners. You are the first one to pick the balloon Yvette! I quite like the three dimensional effect of that shot myself, against the surreal background. Wonderful shots Madhu, best of luck! Thanks Tina. The winning entries were beyond stunning! Excellent photo selections and descriptions, Madhu. Great choices and great images. More than that, this is the first time I have carefully read the classic associations with these elements. On previous occasions I have skimmed through, but now I get a lot from the wisdom behind these thoughts. These are wonderful, Madhu! I especially love the shot of the priest in the river. You can almost feel the water on your hands and face. Really? I felt fire was my weakest. Thanks Paula. If you say it is good, it IS. P.S. that bloke in the water has uncanny resemblance to Mahatma or possibly Ben Kingsley. A beautiful series for the competition. They’re all gorgeous, but the buffalo shot is really special. Good idea represented via various images. I like it. Thanks for sharing.